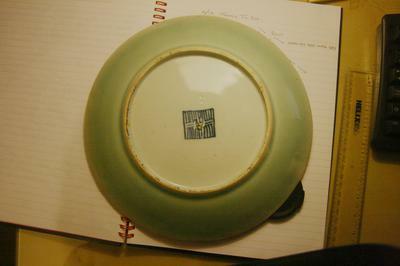 I have a plate that I think is Chinese. It is 25cm wide and 3.5cm high. It is green with a "gold" boarder and covered with small birds, butterflies and flowers. It is green on the underside upto the base which is white. 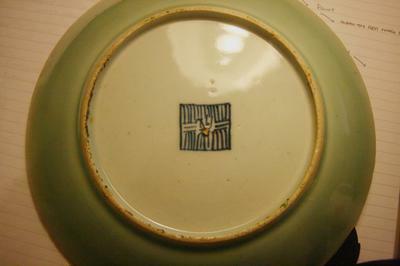 There is a square blue mark on the base of which I have been unable to find any info. Please can anyone tell me more about it and what, if any, possible value it may have. 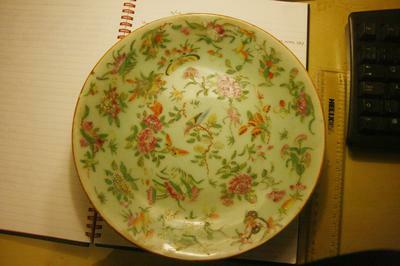 This is a celadon plate with fencai floral/insect/bird decoration. It has a Jiaqing mark. Should be Qing dynasty Jiaqing reign, mark and period.